A lush and imaginative novel that crisscrosses time as a perfumer and a mythologist search for the fine line between potion and poison, poison and passion…and past and present. A renowned mythologist, Jac L’Etoile—trying to recover from personal heartache by throw­ing herself into her work—learns of the sixteenth-century perfumer who may have been working on an elixir that would unlock the secret to immortality. She becomesobsessed with René le Florentin’s work—particularly when she discovers the dying breaths he had collected during his lifetime. "Rose’s latest venture into myth and reality is a page-turning, alluring concoction of fiction infused with fantastical yet actual history. Readers will be charmed by her well-drawn and memorable characters, and they will be mesmerized by her enchanting narrative, which takes them on a mystical and magical journey." "Crisp, evocative prose elevates this above other paranormal thrillers." "A terrific piece of entertainment." "Wondrously original... elegantly written. Rose manages to utterly suspend our disbelief in a book that leaves us, appropriately enough, breathless." "Mysterious, magical, and mythical…what a joy to read!" 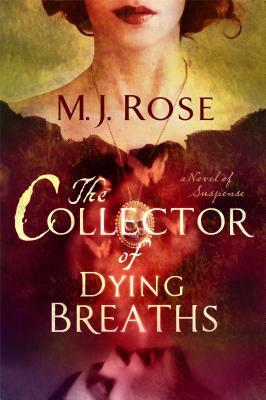 "With an alchemist's skill, M.J. Rose mixes present and past with the dark scent of love and an intricate mystery, creating a blend that is splendidly, spookily magical." "M.J. Rose masterfully serves up suspense with generous sides of philosophy and intrigue. I devoured this fascinating tale about Catherine de Medici and her perfumer simmered with the compelling modern-day story of an intelligent woman in search of personal completion. Alchemy, mythology, and an exploration of reincarnation lace this tantalizing telling. A lavish and satisfying banquet of a book!"